Check out our coverage of the Archie action panel from San Diego Comic Con. 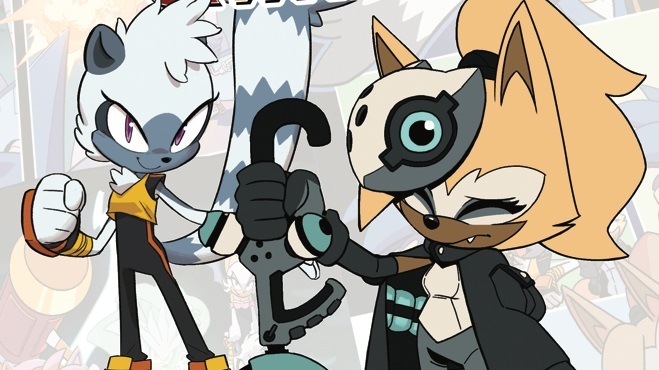 Check out some new art, new info on World’s Unite, the fate of Sonic Boom, the new Silver arc and much, much more! Professionals chatting include Bill Freiberger (Sonic Boom), regular Sonic artist and writer of “The Silver Age” Evan Stanley, Marketing Man Alex Segura, New Archie Action editor Vincent Lovallo and Archie President Mike Pellerito. Headphones recommended as their voices echo in the room. Credit for video goes to Alex Peal AKA Nuckles87. He’ll have a video interview with Vincent Lovallo up on Segabits very soon with even more new stuff. There’s no denying that Capcom’s Monster Hunter 4 Ultimate has taken the world by storm on 3DS. Placing you in the shoes of a brave hunter, you seek out huge creatures and pit yourself against them, learning their ways and finding the best method to slay each beast. With critical acclaim and commercial success behind it, what more could this game possibly need? Well, Sonic the Hedgehog, of course! Released today as free downloadable content, you can now access an additional mission called “Super Sonic Seregios” – emerge victorious and you will be able to craft special Sonic themed gear for your Palicoes, including Caliburn from Sonic and the Black Knight. There’s plenty of other crossovers in Monster Hunter 4 Ultimate – The Legend of Zelda and Super Mario, to name but a couple – but this is definitely one of the coolest looking ones so far. With this and the Sonic Amiibo suit coming to Mario Kart 8, April is set to be filled with bonus Sonic content for Nintendo games! 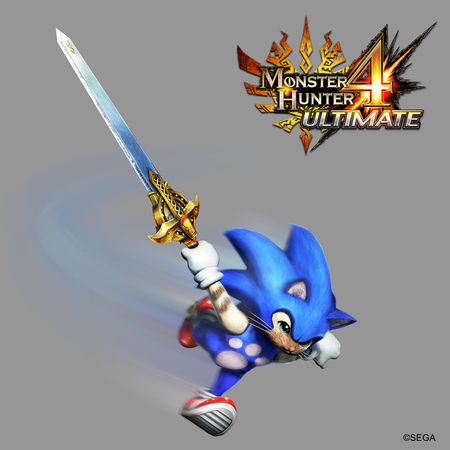 If you own Monster Hunter 4 Ultimate, will you be taking on the DLC and equipping your Palicoes with Sonic and Caliburn? 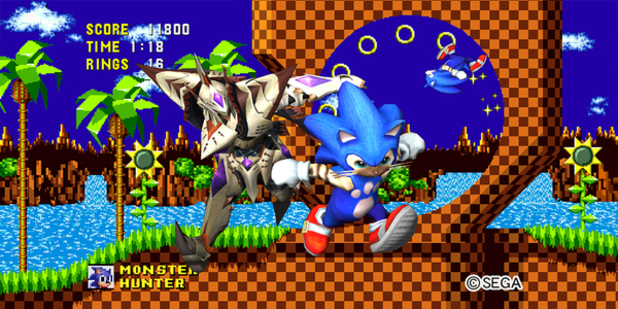 What other Sonic crossovers would you like to see? Let us know in the comments! then they quickly correct themselves with the below statement. 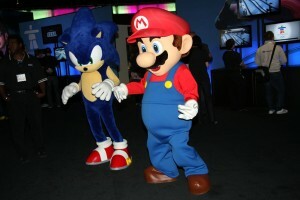 NOW it seems Capcom are a little jealous of SEGA’s Wii success from their Mario & Sonic marketing strategy with Mario & Sonic at the Olympic Games and Mario & Sonic at the Olympic Winter Games. Very sly stab there, one has to wonder what SEGA would say if they were to react. In the past week, I have played the absolute hell out of Mega Man 9, Capcom’s return to the original Mega Man series and 8-bit gameplay and presentation. I am enjoying every minute of it, because I am not just riding a wave of nostalgia, but I am also impressed with the refined gameplay. The fact that a game straight out of 1988 can be successful in 2008 is downright admirable and eye-opening. It makes me wonder, as a Sonic fan, if a retro reboot is in order for another blue hero: Sonic. Would a 16-bit foray treading new ground be a commerical success or another step towards irrelevancy? Today, we take a look at whether or not SEGA has the potential to make some magic, akin to Capcom and Nintendo, and if looking backward has the potential to push forward.